Reactor to be built in 2030s represents a step towards commercial use. South Korea has embarked on the development of a preliminary concept design for a fusion power demonstration reactor in collaboration with the US Department of Energy’s Princeton Plasma Physics Laboratory (PPPL) in New Jersey. The project is provisionally named K-DEMO (Korean Demonstration Fusion Power Plant), and its goal is to develop the design for a facility that could be completed in the 2030s in Daejeon, under the leadership of the country’s National Fusion Research Institute (NFRI). 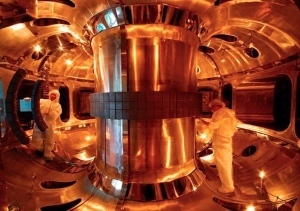 South Korea is already developing the Korea Superconducting Tokamak Advanced Research (K-STAR) project and contributing to ITER, the €15-billion (US$20-billion) experimental reactor being built in Cadarache, France, under the auspices of an international collaboration. K-DEMO is intended to be the next step toward commercial reactors and would be the first plant to actually contribute power to an electric grid. Read more: South Korea makes billion-dollar bet on fusion power : Nature News & Comment.